Our Technology - Royal LePage Real Estate Services Ltd. Proper use of today's technology can push a real estate career into the next level of success. With technology ever-changing, it takes a knowledgeable team to stay on top of new software, hardware, and their potential uses in real estate. Royal LePage constantly goes to great lengths to keep the door open for Realtors who want to learn about how to effectively and efficiently apply the internet, smartphones, computers, apps and everything in between to their benefit. 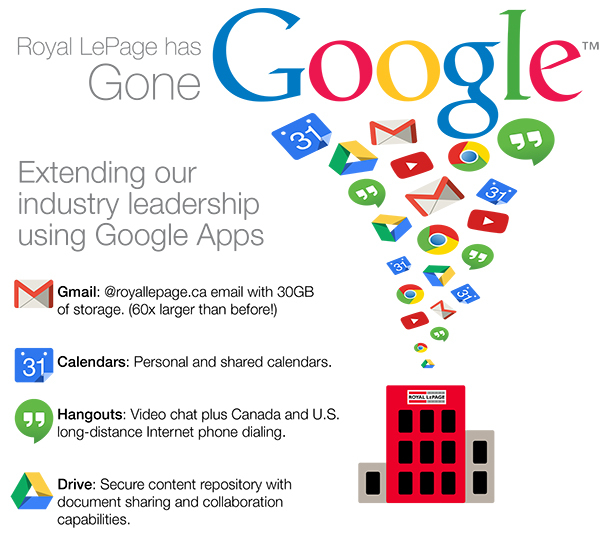 In 2013, Royal LePage partnered with Google to provide their renowned Google Apps to each Royal LePage Realtor at no extra cost to the Realtor. Our @RoyalLePage.ca email accounts are operated through Google's robust and reliable Gmail service. The addition of Google Drive, Hangouts, Groups, Contacts and Docs as well as all the other benefits from Google Apps make networking among Canadian Royal LePage Realtors as well as managing clients, conversations, paperwork and communication easy, quick and efficient. This is a ground-breaking service only offered to Royal LePage Realtors. With tech experts available in-office to help you get your new smartphone set up, and your laptop connected wirelessly to the in-office printers to an extremely reliable and helpful Help Desk led by dedicated and experienced support staff, Royal LePage offers everything you need at your fingertips to be as wired in as you want to be.